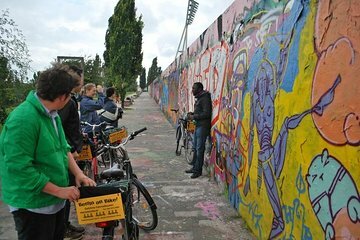 Learn about life in Berlin during the Cold War on this 3.5-hour bike tour of the Berlin Wall, led by a German-speaking guide. Pedal the route of the former Berlin Wall, including the Mauerpark, located on the former Death-strip, and the poignant Memorial of the Berlin Wall. Hear stories of the divided city, harrowing escape attempts and the long-awaited collapse of the wall, as you pass old watchtowers, the Brandenburg Gate and Checkpoint Charlie. This small-group tour ensures a personalized experience and is suitable for all abilities.